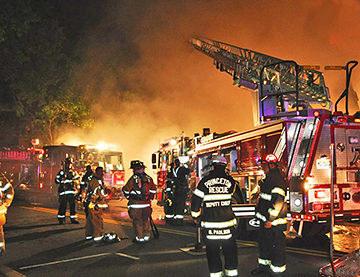 NIGHT MISSION: Firefighters from all over the region had their hands full early Friday morning as a blaze destroyed a building housing two restaurants at 354 Nassau Street. Also on the scene were members of the Princeton First Aid and Rescue Squad, including Deputy Chief Greg Paulson (shown here) and Mike Bonotto, who took the picture. No injuries were reported; the cause has not yet been determined. It was the first three-alarm fire in Princeton since the 2008 blaze on College Road. Council member David Goldfarb reported at last Tuesdays Borough Council meeting that most of the debt owed to the Borough by the Township has been resolved. A single car accident early on the morning of August 1 resulted in the death of Kristen Anne (Kristey) King, a recent graduate of the Hun School of Princeton. Travel Camp  2 additional weeks added! exclaims the Princeton Recreation Departments website in large, red letters. The theme of this years annual membership exhibition at the Arts Council of Princeton is Native Son: Works Inspired by the Life and Legacy of Paul Robeson. This years exhibition has been renamed the Princeton Annual, and it is the first year that it has been held at the Paul Robeson Center for the Arts. It was the third and decisive game of the Princeton Recreation Department Summer Mens Basketball League championship series and Shahid Abdul-Karim was sticking with his playoff routine.